Just a few pics tonight - I made it ahead of the system all the way until the border with Oklahoma. Pretty intense for what we thought was boring early on! Let's just say I got ahead of the Perryton supercell only to find that the outflow pushed up some nasty storms near the border with Oklahoma! Yes Arnett with base balls clobbering my vehicle busting the windshield and damaging the body on one side!! That is - the side facing north, breaking a light and also almost losing a plastic cover near the mirror! All at night around 10-11pm! 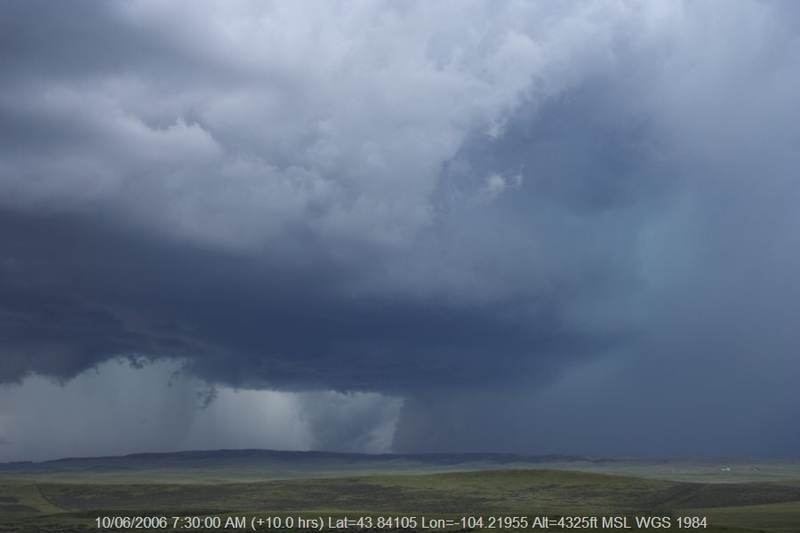 Ahead of the storm in the Texas panhandle was this developing rapidly on outflow. 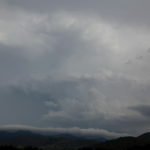 It dropped several powerful bolts - I guess I got one of them - that means a developing powerful updraft I guess. Can you see the base surrounded by bolts! Yes that's the storm that would consume and batter my vehicle! 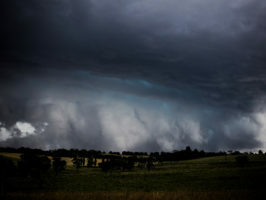 What can be said, in some respects a perfect chase tactically and with very large hailstones - something missing in the most recent chases. Critical errors had been made at critical times that led to unplanned outcomes. 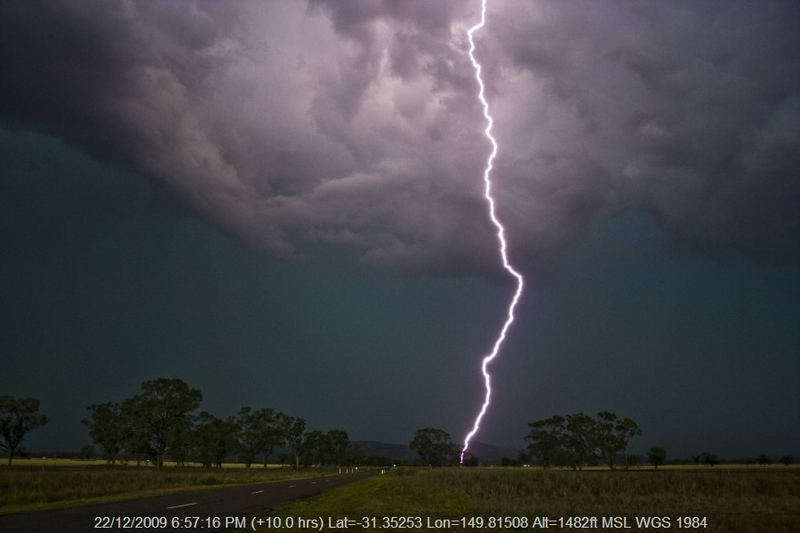 My philosophy is if I had not targeted a storm then I didn't deserve getting it. In this case, targets had been set but distractions had totally quashed any recollection of those targets. Well - that is until after the chase! Enough said... It is often said that too much data can add to the confusion! Leaving Sydney early, I wasted little time in getting to the target of Ebor. 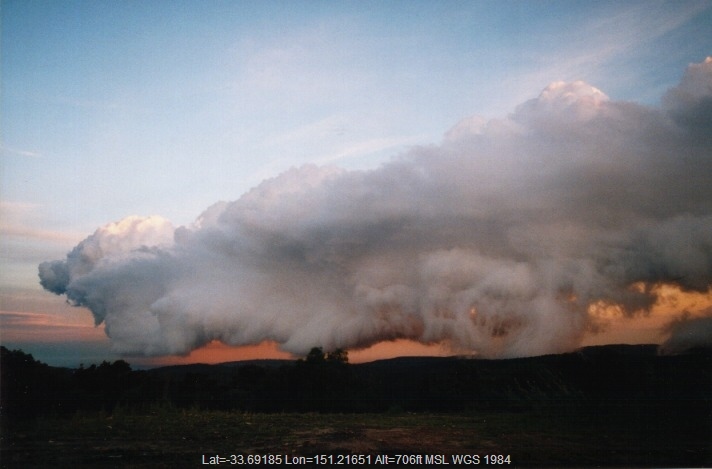 I was fully aware that much depended on the positioning of boundaries as to storm initiation. First stop lunch at Thora at the foot hills of the Dorrigo Plateau and then Dorrigo. 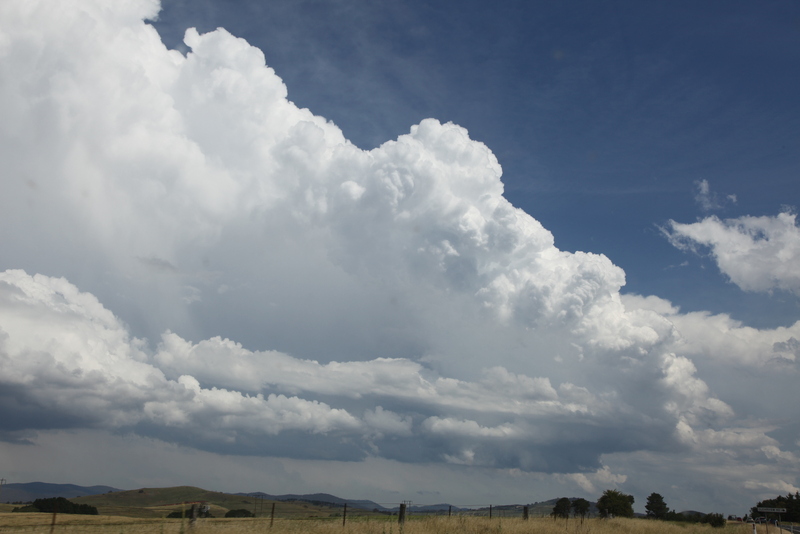 The waiting game was short lived with the usual suspect cumulus developing near Ebor. 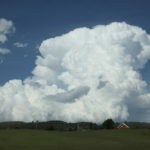 I progressed towards this cumulus cautiously checking whether cumulus had developed further back. 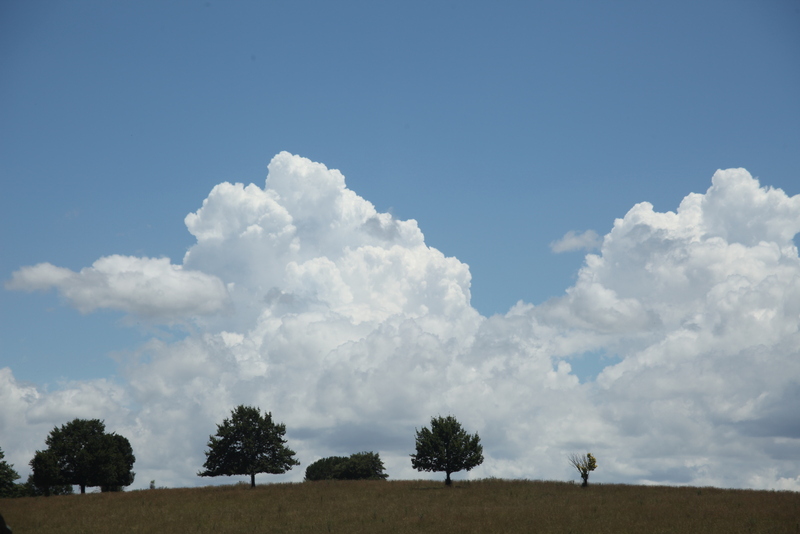 Instead, something was wrong - the cumulus had not consolidated near Ebor. 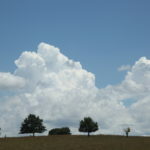 More cumulus had developed further west that seemed higher based. Nerves kicked in. Was it the confusion, or was it the wait? Had I come up for nothing! Once again, I had to remind myself that CAPE values on the models were near or in excess of 2000 J/kg with good moisture and lower level turning. It was early and patience required. 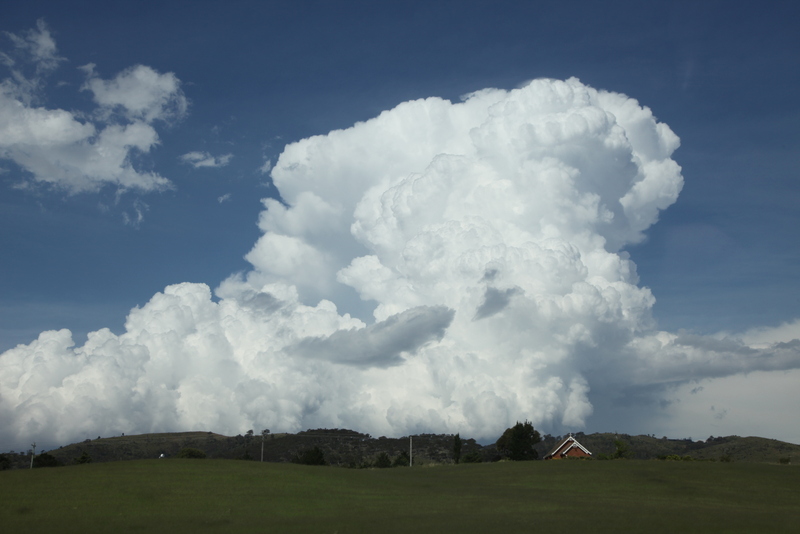 Entertaining myself between Ebor and Guyra, the cumulus nearby dominated with any hope of development in the Dorrigo to Ebor corridor diminished. The boundary was set further west - the nerves settled. 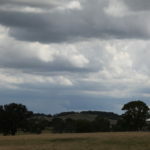 A couple of showers developed but the one east of Armidale although weak had tapped low level moisture with a consistent lowered base. It was difficult to ascertain its direction - radar providing the key. 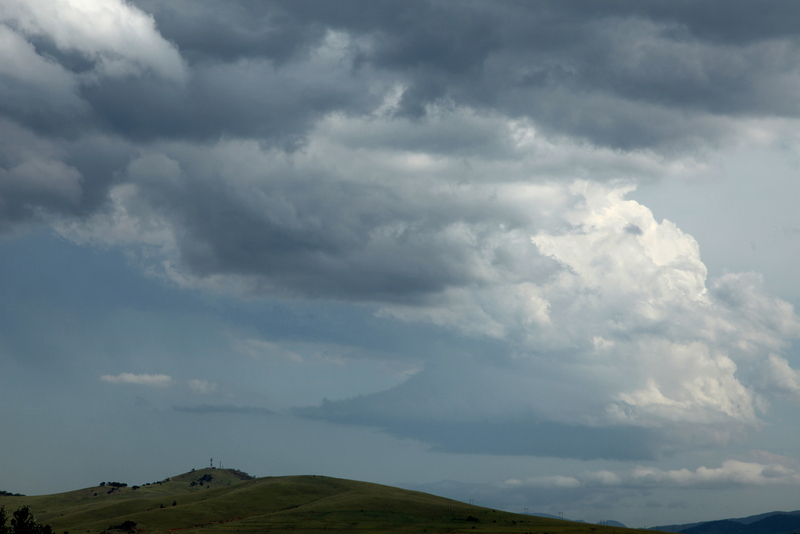 An east-northeasterly course put the storm's intercept point at Ebor. My first move was merely a tactful one - after all, the storm was not intense. The lowered base continued to feed off the moisture. 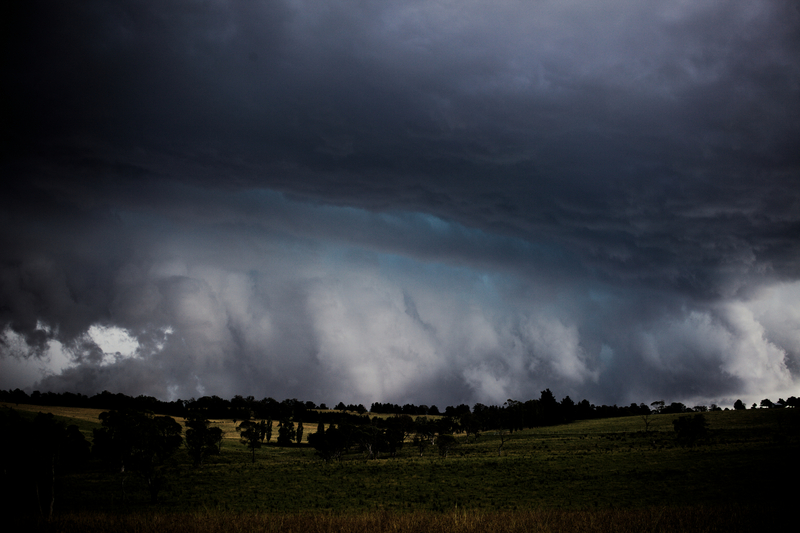 Inflow structure persisted as I made the Wollomombi turnoff. I felt emotions of frustration and excitement! 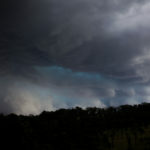 The storm had remained organised and dumped hail as I approached the anvil canopy. 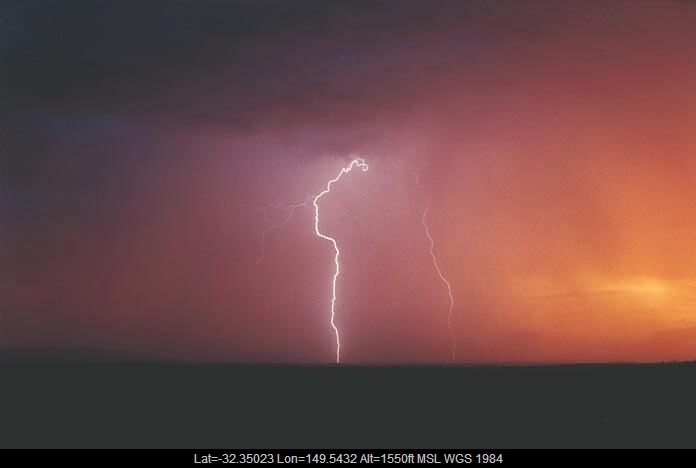 Lightning increased and the storm literally exploded! But views were limited and I had to make do with what view options arose! The storm to my surprise had made a northerly track - just in time too! 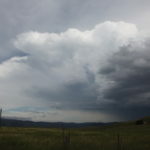 This was turning into a beast with a consolidated rippled base and inflow tail in what seemed to be a wall cloud and shelf cloud combination. And that green tinge! Wow! It was like a fluorescent glow. 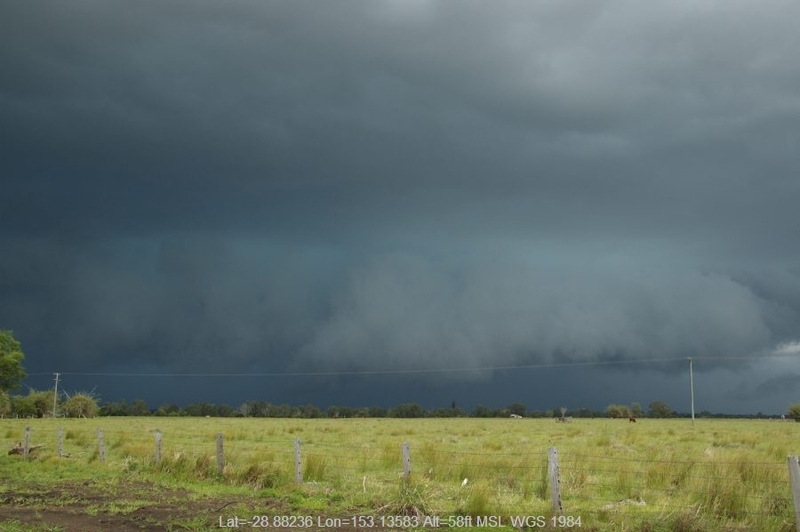 Cloud base just above the ground with shelf or inflow feeding off the ground! Over a hill, I could simply not resist another perspective shot! 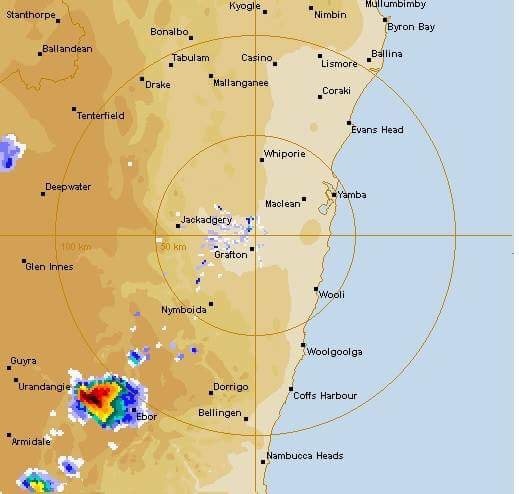 The anvil streamed off to the east! It was pumping lightning at an increased rate but I was here for one thing - hail! 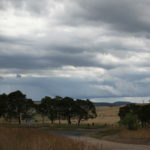 Out to the main road presented an ominous sight! Tripod and camera out there capturing time-lapse and then the infamous error that had plagued this trip - the recording had stopped. No time for panic - IPhone 8 should be fine to capture video holding as still as I can this North Coast style spectacle. 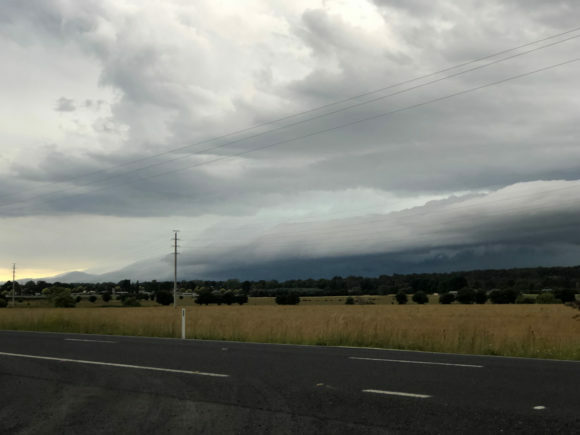 The shelf cloud and wall cloud region extended to it's northwest and seemed to wrap (Nick Moir texts me a little later to indicate what seemed to be a hook). Then I heard something nearby on the road. Looked around. Nothing. Then moments later another. It seemed like I was hearing hail but unable to see anything. Then it dawned upon me. I had dismissed the distant constant sound. Then another splatter. 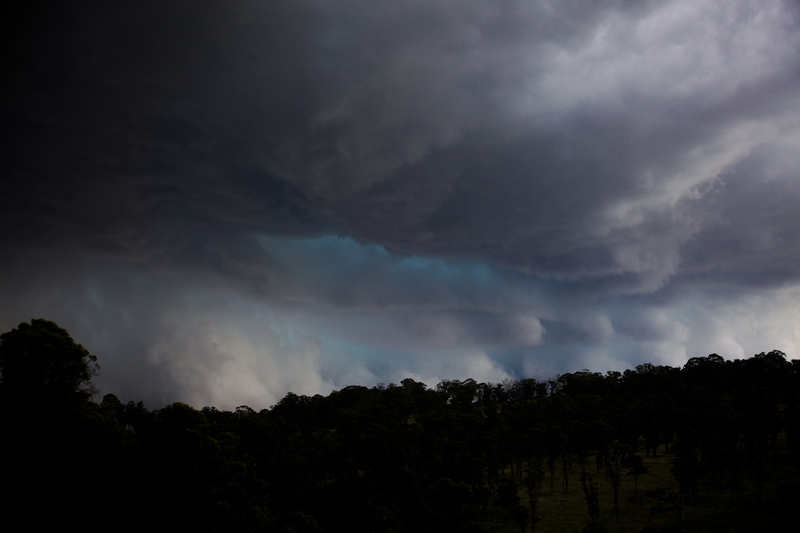 I captured over a minute of video and then could see hail was imminent. They were not small either 2 to 3cm hailstones. Back in the car, hail increased in intensity. no chance of escape unfortunately. Pure hail now falling intensely. 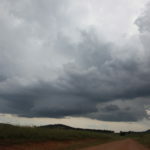 I carefully U-turned and headed west northwest - the cloud mass and base lining the road - the core about to unleash. Hail almost covered the road as the torrent of near pure hail fell profusely. Deeper into the core and thud! Even larger hailstones! Demister on it was still difficult to see. An immediate hail fog had set in for good measure! After about a kilometre or so, a side road opportunity presented an open area to move away from trees. 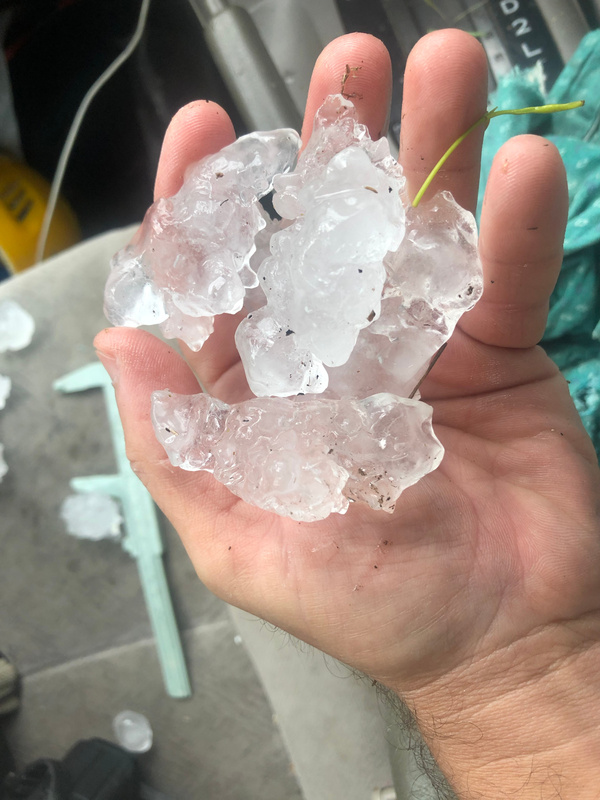 Constant gold balls or larger hail pounded the vehicle. Tree leaves were being stripped constantly. 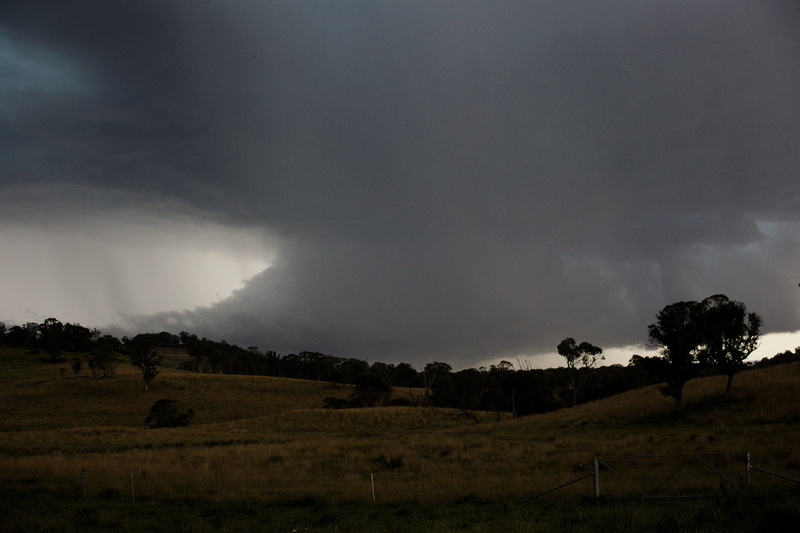 I positioned myself just in case larger hailstones feel as the main core passed over. The torrent continued for what seemed more than 5 minutes. I attempted to check some hailstone sizes but I was getting drenched with continuous rain. And of course occasional crackling thunder did not make it safe! 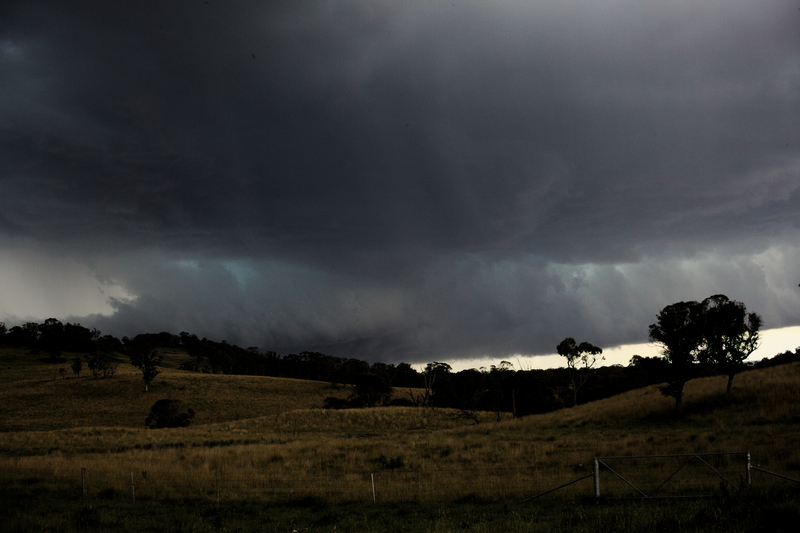 I went further up the road and the sporadic very large hailstones were still falling. Soon, all that remain was the annoying rain. Difficult to measure without being soaked and cold. 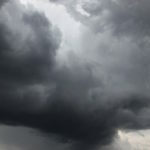 Given the storm had moved into sparse road regions, I remained to document what I could. 4cm hailstones in my location was simply not right. 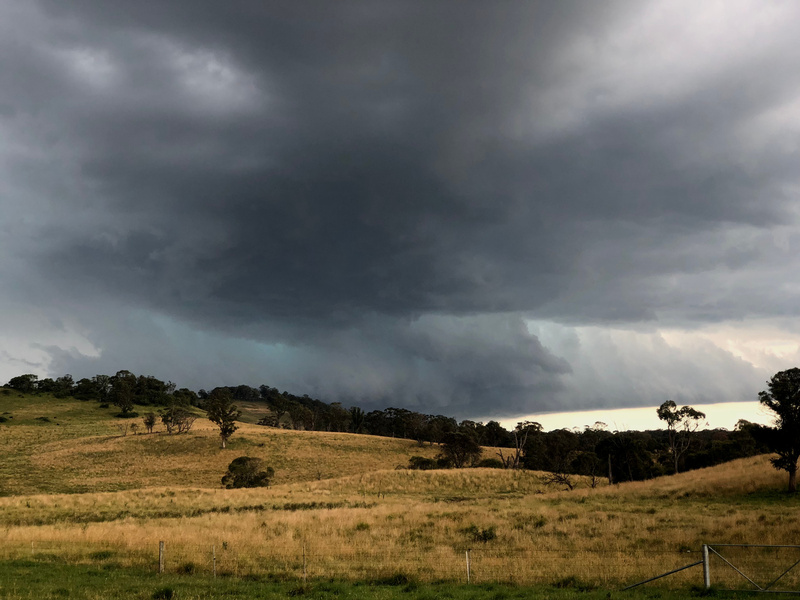 Further up the road, I checked intermittently measuring hail 4 to 5 cm and then finally hail length of some of the wierdest fused hailstones I had ever come across at this size neared 6cm. Stripped leaves littered the road for about 10 kilometres! 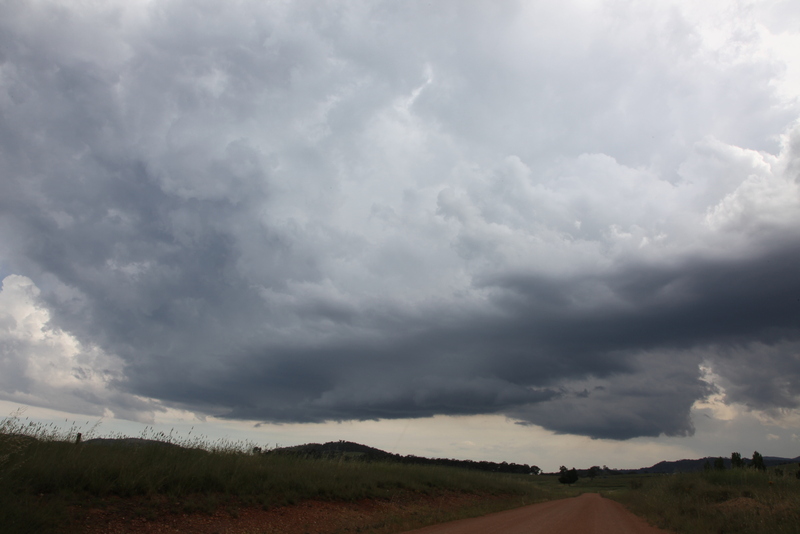 After several measurements along the several kilometre path, I decided to head west where other storms had developed. Furthermore, it would allow me to see whether this storm was still severe. 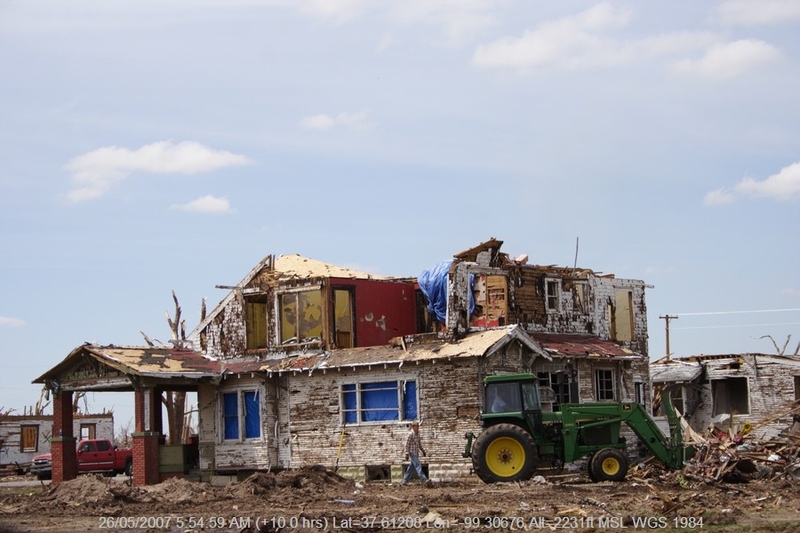 It seemed to have weakened back-building somewhat. 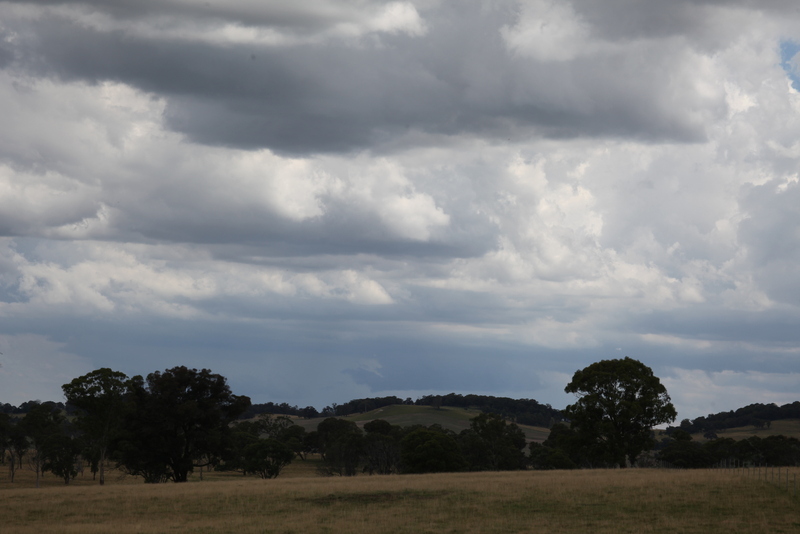 However, on approach to Guyra, one major pulse invited me to the next phase. 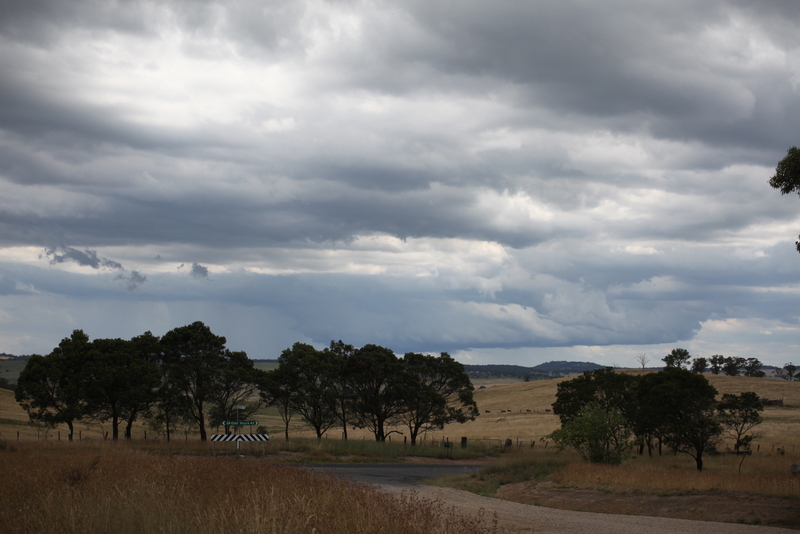 The challenge was to intercept prior to Glen Innes Grafton route. 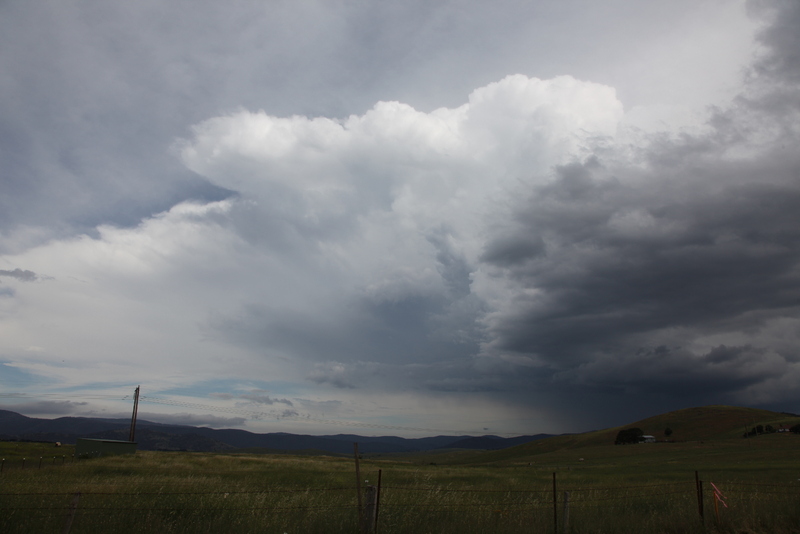 On approach to Glen Innes, the storm on radar seemed to line out with a northwest back-building behaviour. 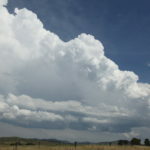 Instead, I turned down towards Inverell for peak of other active storms. 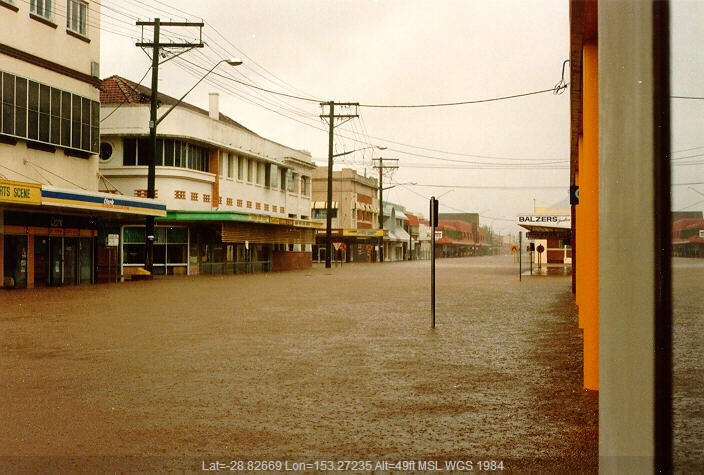 Within 30 kilometres, it was evident the storms were high based! 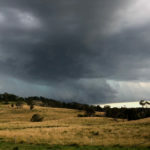 You wouldn't believe it, an intense black cored storm on radar had side swiped Guyra. 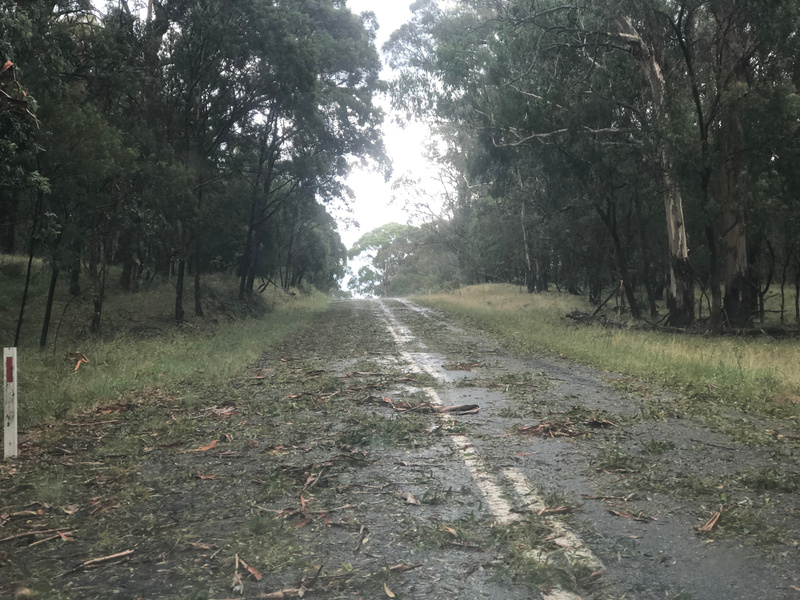 About turn and my determination was to get to Glen Innes Grafton road once again. A magnificent shelf that blended into the undulating landscape greeted me! 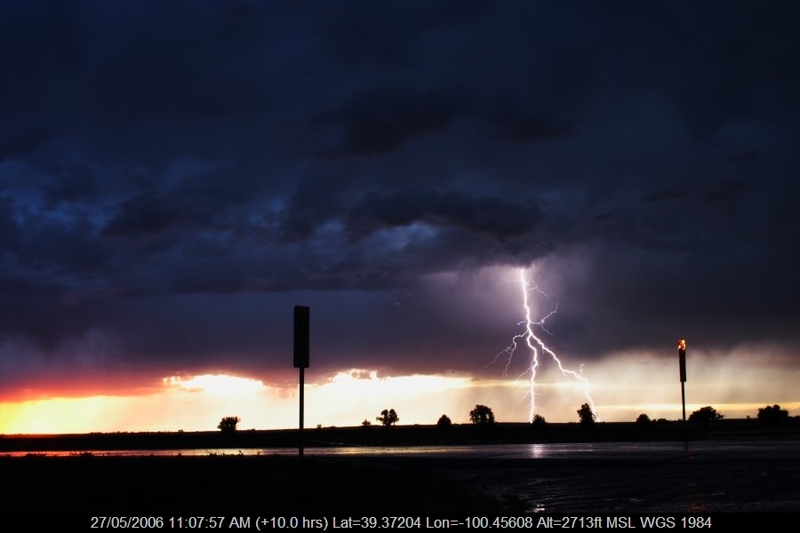 So, although not intense, at least a secondary storm was observed. It was reasonably lightning active and I allowed the whale mouth to pass across to the northeast. This basically ended my chase day. An intense few hours with a few more anvil crawlers and bolts observed on the way to much awaited meal at the local club. A very enjoyable day indeed. It was a tough day - tough decision. 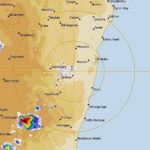 Do we chase higher risk of failure stronger cap near Lithgow and surrounds or down south where indications were that if storms did go up thee was better shear environment - supercels perhaps? Canberra bound we were. All on time too. 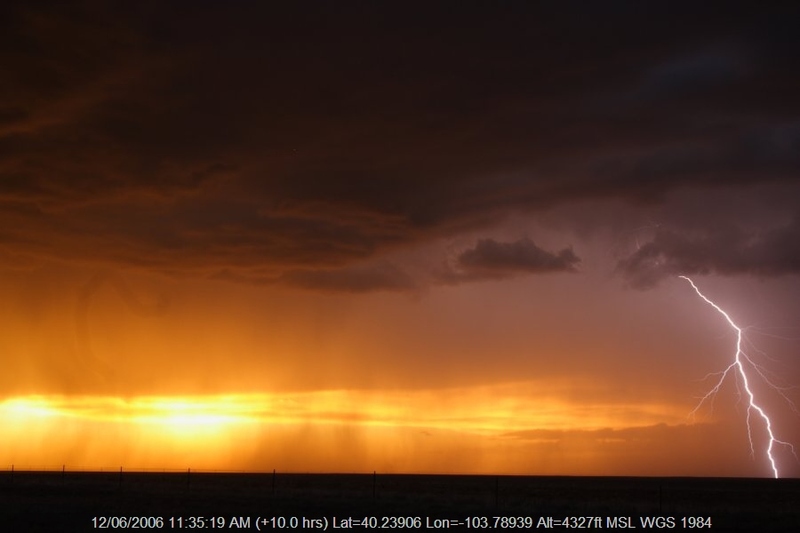 Except - the storms were not on time - they were virtually non-existent! 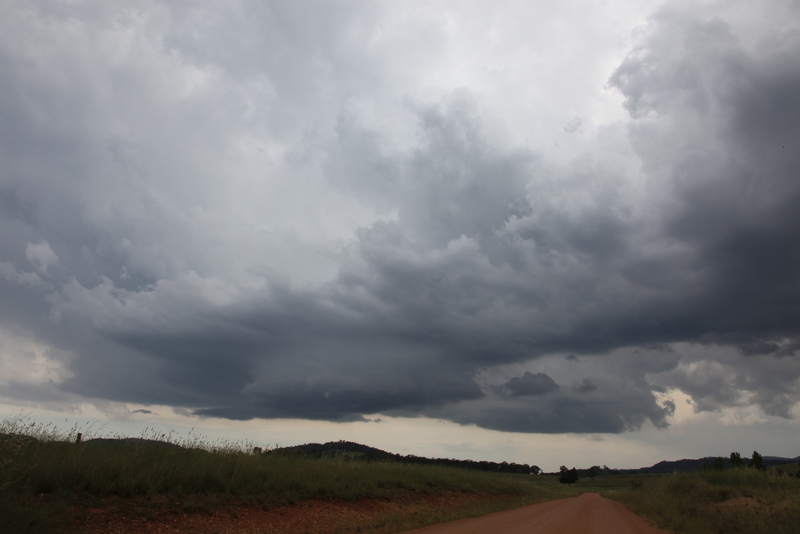 Our only option was to head towards Bredbo where a strong cell had organised. It was already entering no roads country by the time we got to it. 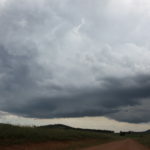 We headed after the cell towards Cooma that showed inflow base features. 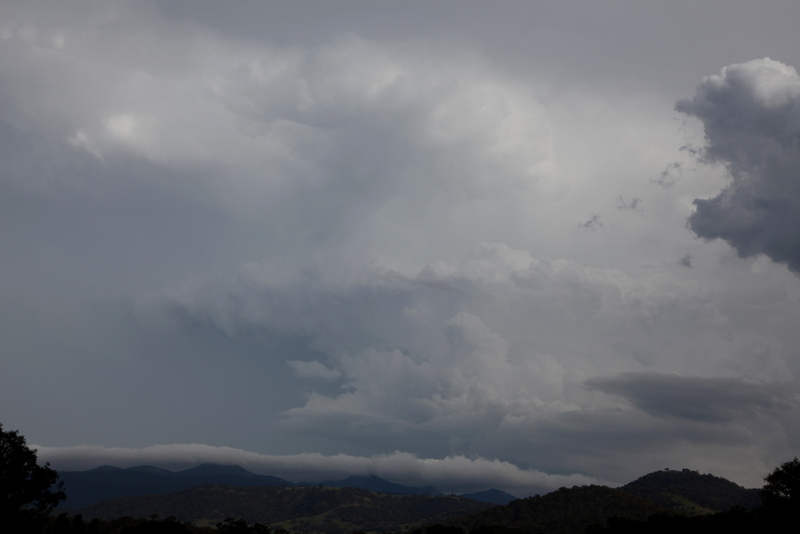 The updrafts were eventually disorganising. But alas I noted a string of stratus racing under it! Undercut? I look behind and where we had passed several congestus towers had showed up! Turn around Colin! South easterly winds were streaming and meeting the lighter northeasterly winds further north near Bredbo! The base consolidated quickly as it does in this part of the world with the addition of moisture advection. 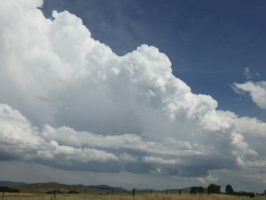 This did develop into a storm that once again intensified to the east of Bredbo. Some time-lapse of the base provided some rest and observational opportunities. 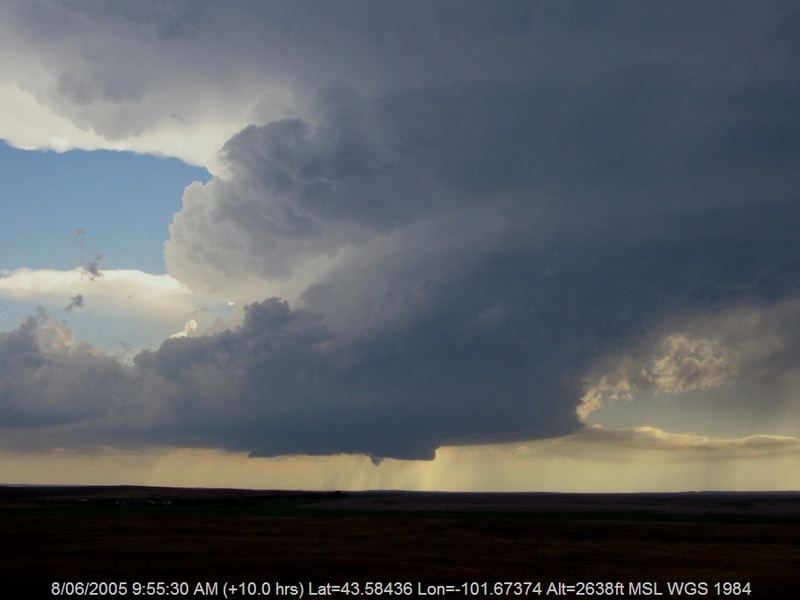 The storm produced a decent anvil and some interesting structure. 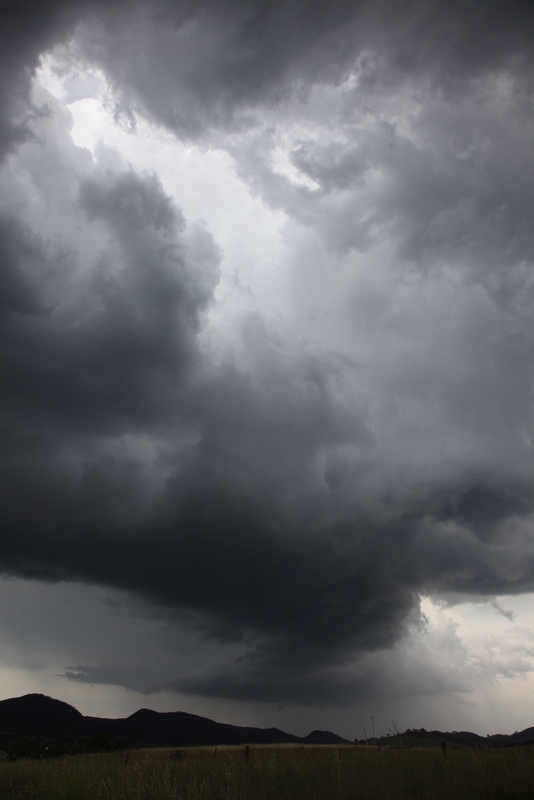 Time-lapse did not show any clear or obvious rotation however from our perspective. This was to be the end of our chase. As we proceeded beyond Lake George, radar indicated a nice storm had developed but alas it did not remain intact for too long.